When you are staying in Maharashtra for a decade Ganesh Chaturthi becomes the most celebrated festival of your life. Ganesh Puja is celebrated with gaiety and fervor in both Mumbai, the most spirited city of India as well as in Pune the cultural capital of Maharashtra, where We have spent last 12 years of our life. Let me confess one thing, I am not a religious person who follows the nitty gritty of every ritual ,do fasting, gives Anjali and all. Rather I love the festivities all around us ,the positivity these festival bring in our life, how these celebrations connect people with each other and of course the fun part of it. In Maharashtra, You can feel the festive atmosphere months before the actual day when you hear the dhol tasha practicing sound on your way back home, the idol making in progress and finally the big Mandap decorations start weeks ahead. Mood brightens up when just a day before puja you see people taking the idols of Elephant god crafted in different color, shape and size. In our housing society, On the auspicious day we get up early, take bath, adorn ourselves in traditional attire to welcome the deity with beating drums and loud cheers of “Ganpati Bappa Moriya”. The celebration continues for next 10 days with such grandeur. Every morning you get up to the rhythmic sounds of arti ,evening are fun filled with cultural programs by small kids, chappan bhog made by all families offered to god, a feast organized for all society members and finally immersion of Gannu baba with some Bollywood dance numbers but with a heavy heart. 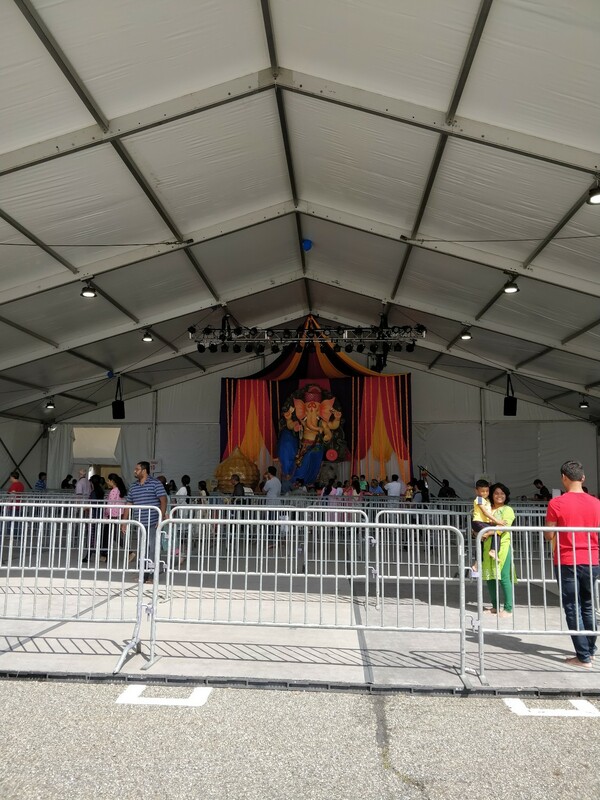 Alas, this year during Ganapati we are at New Jersey, USA ,thousands of miles away from home but I really didn’t want to just sit at home and feel nostalgic by reminiscing about the enjoyment we had back home. I have seen small idols kept at all big Indian supermarket and other decorations and Puja items are sold in exorbitant prices. 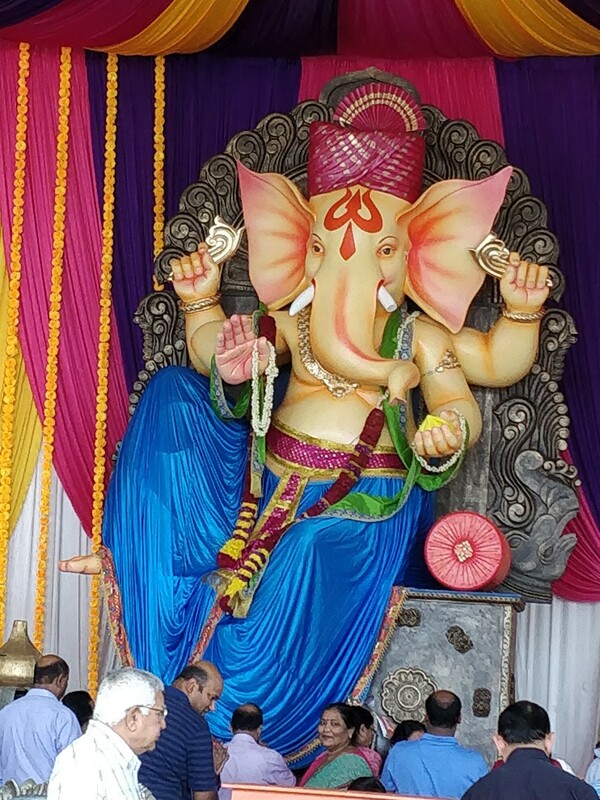 People majorly from Maharashtra and Gujarat are keeping Ganpati at home but the festive atmosphere was totally missing in our surroundings. 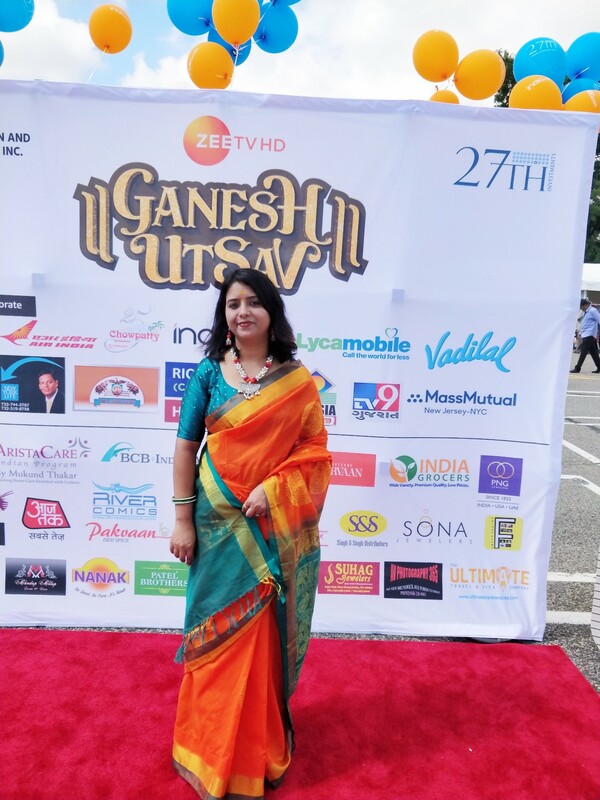 After some research on Google and enquiring friends and neighbors we came to know about two Pujas nearby, one done by OSA-NYNJ which is the Odiya association of New York new jersey and another at Woodbridge mall with sponsorship from many big banners like Zee tv, Air India, Aajtak, P&G and many more. 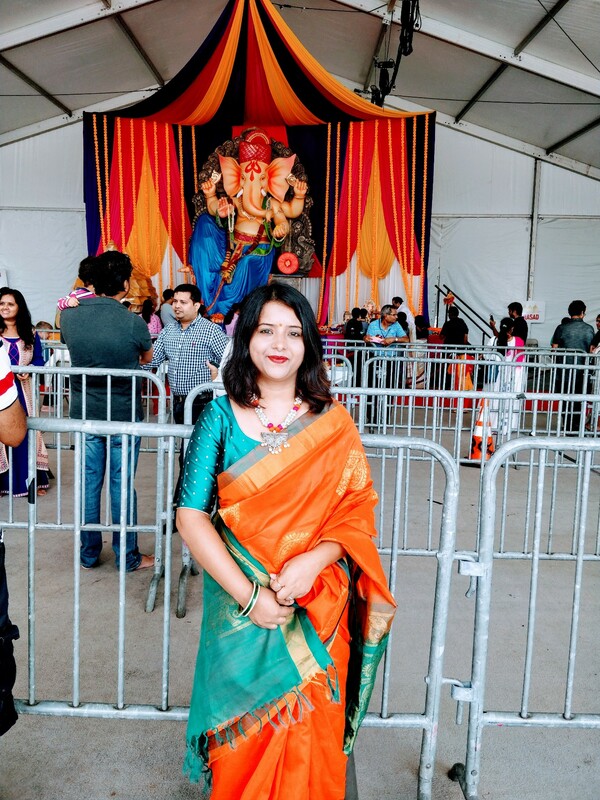 So on 3rd day of Ganesh Chaturthi which fell on a weekend we finally decided to experience the Woodbridge mall Ganesh puja.When we reached the venue, we were surprised to see that arrangements were done in a grand scale with a big spacious pandal and a 14-foot Ganesha idol. The festival is hosted by 1947 Productions & Entertainment Inc and continues for 5 days from 13th September till 17.Once we entered the pandal the chanting of Ganesh Vandana immediately soothed our earbud as well as mind. We saw option of buying Puja thali for 10 dollar and it was not bad at all considering exorbitant prices charged on individual items at Indian supermarkets here. The whole thali consisted of few modoks, two bananas, one apple, one chunri (red stole which we put on idol),one small bottle of mango juice and two shopping bags with Zee tv logo on it. Standing in the queue for few minutes our prasad was offered to the deity by the priest present there. 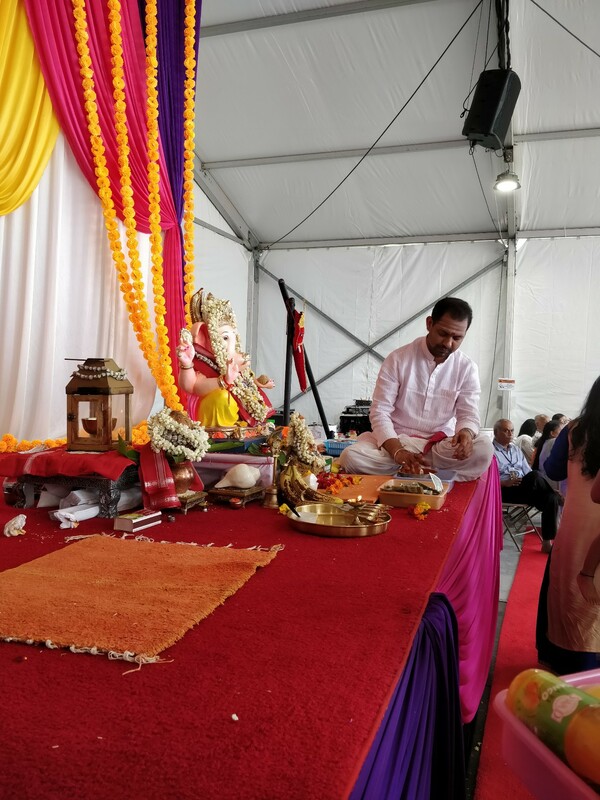 Once the aarti and Puja was done we wanted to explore exhibition of Indian clothes,Jutis, Home Décor, Books for kids on Ganesha and other items arranged in the premises. 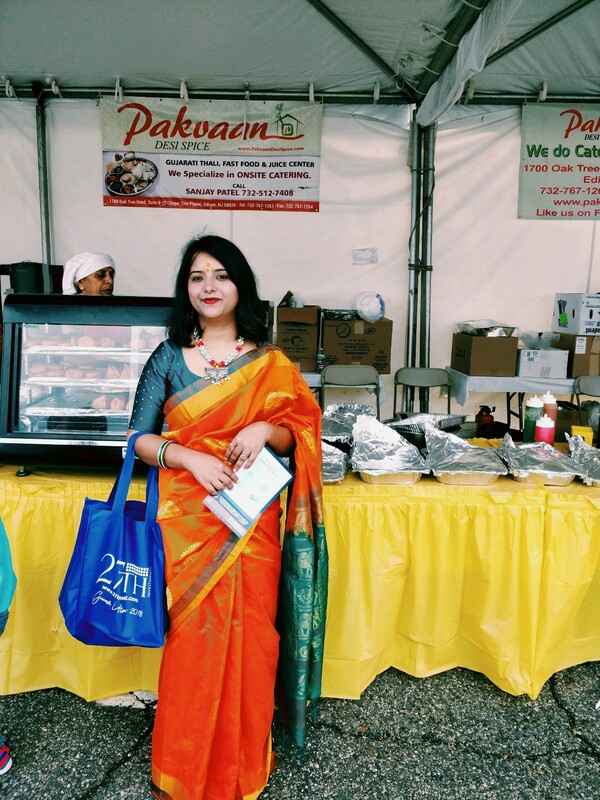 As expected the majority of crowd were Indian but few curious American could be seen roaming around and trying sweet dishes like kulfi. 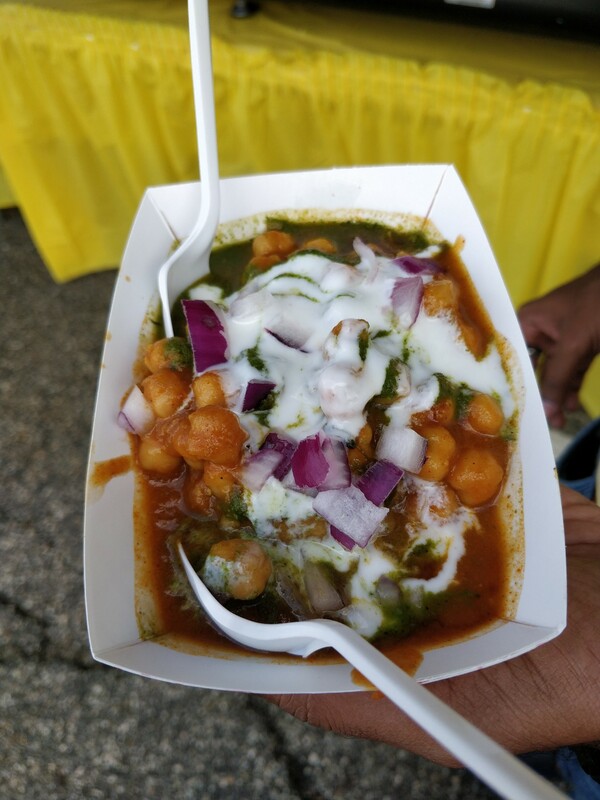 At last, it was a golden opportunity to savor some Indian food in the food stall. After spending few hours in the pandal finally we came back home with our hearts filled with the blessings of the Vighnahartha and our mind soaked in so much positive vibes. Very Nice Bhauja, the content very neat and well informed. The narration of Ganpati is Soo Soo good… All pixx r fabulous..
Each bit of your narration about Ganapati Bappa celebration and such lively and colourful pics are just awesome..you are a STAR so keep writing..
Amazing….very nicely n neatly written loved it. Keep writing you Rock dear! !